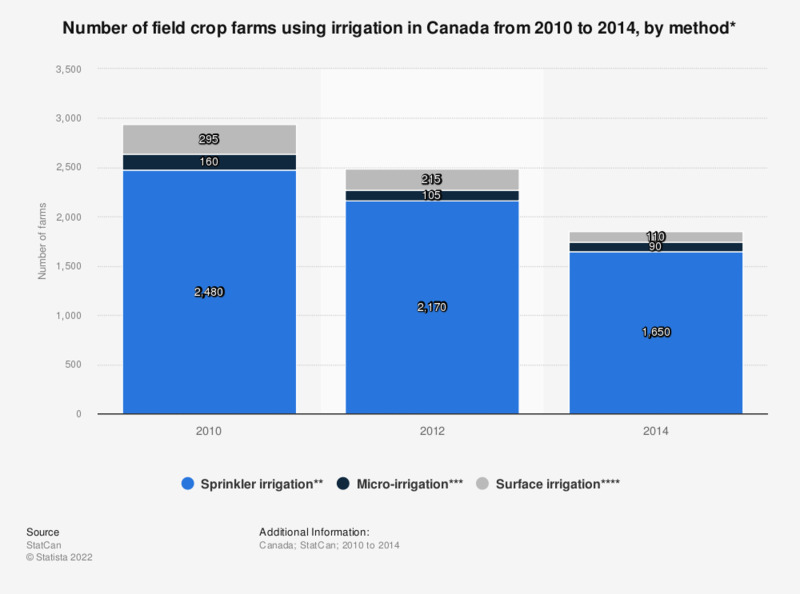 This statistic shows the number of field crop farms using irrigation in Canada from 2010 to 2014, by method. In 2010, there were approximately 2,480 field crop farms using sprinkler irrigation methods in Canada. * Exlcudes Yukon, the Northwest Territories and Nunavut. ** Includes: hand move; solid or permanent set; side roll, wheel line, wheel move or wheel roll; traveller, volume gun, travelling gun, walker, overhead or circular; linear move; and central pivot. *** Includes: surface drip, sub-surface drip, micro-sprinkler, bubblers, microjet and hand watering. **** Includes: down rows, furrows, corrugations, border dyke, level basins, uncontrolled flooding and back flooding.